Stress — linked to weight gain, bad digestion, depression, and more — is the enemy of good health. And since it's hard to control stress-inducing circumstances on the subway, at the office, or in traffic, it makes sense to start somewhere simpler: at home. "It should be a place to relax and shut the world out," says interior designer Shelly Lynch-Sparks. As a designer for Homepolish, Lynch-Sparks helps make high-design secrets available to those who don't live on Park Avenue. (Consultations cost just 50 bucks!) 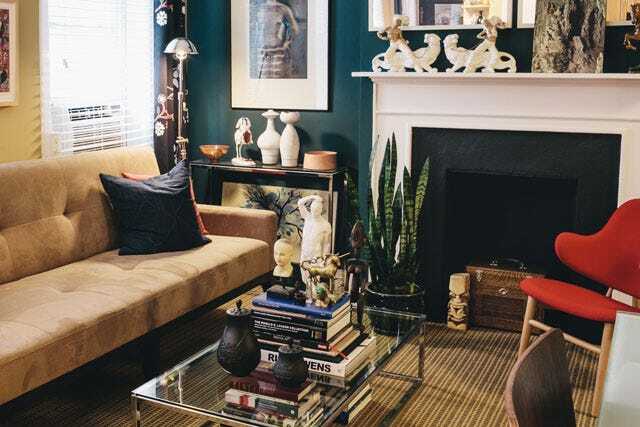 Your home's design seriously affects your state of mind, she says, especially if you're living in a New York City apartment prone to maddening features like no closets and six inches of walking space between your bed and the wall. We asked Lynch-Sparks to share her insights on how to create a Zen paradise you'll want to wind down in. Here are five ways to get started — with photos of Homepolish's gorgeously-designed spaces to inspire you. As anyone who's been driven to tears by not being able to find anything knows, clutter is super stress-inducing. "If you can fix this you’ll be so much happier," Lynch-Sparks says. 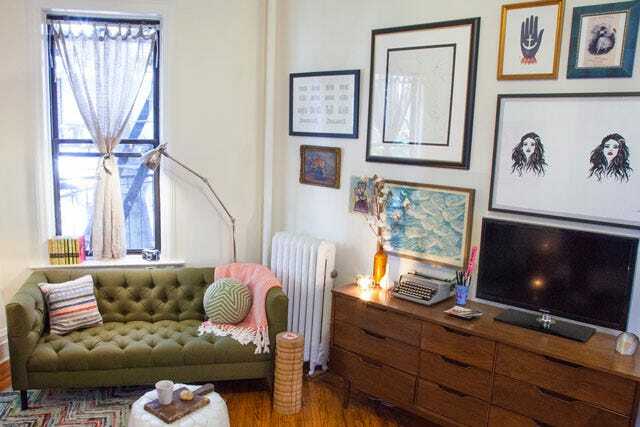 It's the number one issue Homepolish's designers address. Take a trip to The Container Store and then memorize the mantra — everything has a place, everything in its place. "Take a few extra minutes to carve out a specific place for each item, and you'll save time and sanity in the long run," she says. And, hide that pile of papers you're just never going to get to in a pretty, patterned box — so at least you won't have to look at it. Lynch-Sparks suggests investing in some low-maintenance plants like succulents (so that you don't get stressed taking care of them), and you can also add nature-inspired textures and patterns to your decor. Bonus: "A lot of people don’t realize that they really do clear the air and help with toxins, too," she says. "If you're going for more of a relaxing Zen-like atmosphere, you'll want to use cool colors like blue hues or soft neutrals," Lynch-Sparks says. (There's a reason super-bright, primary colors aren't common at spas.) Don't fear combining sweet pastels either; you can break them up with black accents to keep it modern. Harsh, overhead lights that beam down too brightly are headache-inducing, so stock your apartment with task lamps — desk lamps, floor lamps, and table lamps. Warmer light, produced by halogen bulbs, tends to be more soothing. But, if you want to protect the earth's health, too, choose fluorescent and get a shade that tempers or dulls the brightness a bit. Burlap or linen shades would work well, she says. "This is definitely optional." Lynch-Sparks says, "But, some of our clients like to have symmetry to create a cohesive room. It creates balance in the room." If you're OCD about picture frames being slightly crooked, then you'll probably benefit from this concept in your space, and possibly even sleep more soundly knowing everything is in balance.